Before entering California I decide to follow the suggestion of the lady at the entrance booth at Harris State Park. 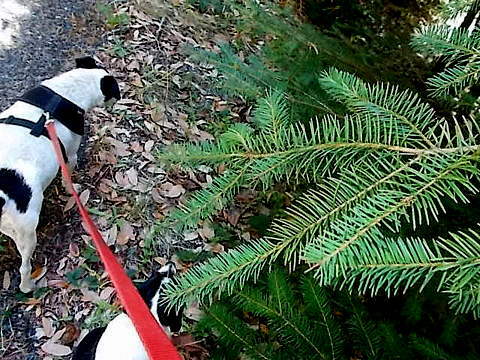 She says that Loeb SP has magnificent specimens of redwoods and it’s only about eight miles out of Brookings. 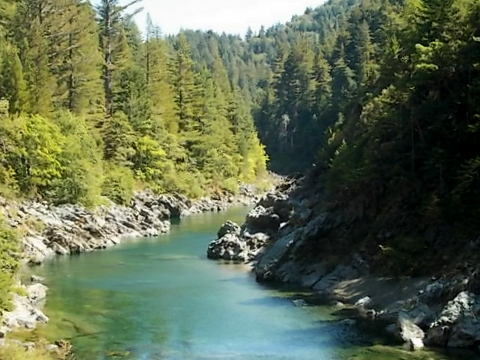 The road follows the course of the Chetco River. The park is pleasant enough ($20 a night, no discount, electric only), if a bit antiquated with 15 amp electric. For some reason my big, bulky 30 amp adapter doesn’t do the job. Jim the camp host lends me one, and bingo, I’m in business. 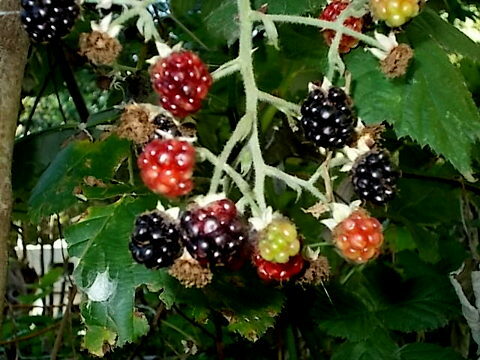 Bushes of ripe blackberries border each campsite. Unfortunately seeing the redwoods requires a hike that’s longer than the crew and I can handle, given Bridget’s still hopping on three legs. Oh well, a slight detour. We’ll only stay one night. It’s a pleasure to be in forest again where the air is clear and at room temperature, not to mention . . .
. . . dry toilet paper! Exploring the Oregon coast was fun, but when you go to the bathroom in the middle of the night and find that the air is so damp that the toilet paper feels like it fell down the hole . . . well, I say it’s time to move along. We enter California for the first time! I don’t need the welcome sign to sense a difference. Whereas other states have signs suggesting “Headlights for Safety,” California orders you “Turn on headlights next 12 miles.” Several other directives follow in quick succession. . . . “Check headlights” “Speed monitored by air surveillance” and so forth. I remember being told to watch my speed in this state which is hard-up for money. This sets up my nerves for the checkpoint. Maybe I watched too many WWII movies, but checkpoints make me nervous. The uniformed lady with a clipboard is no-nonsense. She looks at my plates. “Um, late June. No! No, it was early July.” Whew, almost messed up the first question. “The Black Hills.” She flips up a page on her clipboard and studies something. “Well . . .” I try to bring up a picture in my mind of the dark interior of the fridge. “I have some lettuce and . . . uh . . . radishes.” Again she checks her clipboard. Oh dear, please don’t kick me out of California. Why am I always so dang honest? I breeze on down the highway and then it hits me. I have one zucchini somewhere in the back of the refrigerator. Now what do I do? I could go back to the clipboard lady and confess my sin. Naw, that’s dumb. Well, I suppose I could eat it. No, that’s no good either. Judging from the condition of the zucchini the last time I saw it, it’s probably so rubbery now, it can be bent into a right angle without breaking. Jeesh, I’ll just have to haul the dang thing all the way back to Oregon. Inexplicably the road widens into a massive, multi-lane thoroughfare and then narrows again. I pull off for some gas. Ooh, ooh, Wal-Mart. Before long the crew and I are sitting in the Perfect Tow Vehicle chomping our jaws on some groceries, when a guy of retirement age swings his car around in front of us and parks so his driver’s side window is near mine. He brings his window down. This is the second time I’ve heard this question in a week. I’m proud of my Best Little Trailer so I’m happy to answer. “Well, over a year ago, it was around fifteen thousand base, and around eighteen with the options.” I explain the options. We end up talking about ten minutes. He says he’s waiting to retire so he can collect full retirement Social Security. Further down the road, I spy a gas station. The big red sign (red with embarassment maybe?) proclaims the price of $4.45 a gallon, regular unleaded. I park and climb out of the PTV. I ask a lady on the other side of the pump, “Is gas always this high in California?” I see she has Arizona plates. Oh well. Welcome to California! I’ll catch up the blog very soon, including a report on Bridget’s visit to the vet! 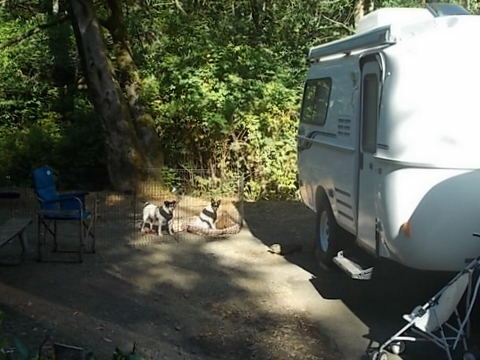 This entry was posted in Simple living and tagged Alfred A. Loeb, blackberry, California, casita, Harris State Park, nature, Oregon, redwoods, RVing, Tow vehicle. Bookmark the permalink. hysterical about the zucchini! Love your blog, Sue. I feel I should pay to read it, it is so entertaining and informative. Hmmm…. maybe you should put a Paypal button somewhere on here? Thanks for the nice comment, Jool. I lucked out when I got to the California check. A very pleasant young woman fell in love with Jack, and he with her. With a line of vehicles behind me that I’m sure didn’t appreciate the wait, she got a treat for him and another agent came over to greet Jack, too. Must be the luck of the draw. Now, at Hoover Dam, they weren’t quite as friendly. All Business! A smile would crack their faces! Glad you’re enjoying the redwoods, Sue. Are you going to drive the Avenue of the Giants–it’s a beautiful ride. I’m anxious to hear about Bridge tnad where you are next time you post. LOL Jool !!! If ya wanna pay for it, you can order it from Amazon for your kindle !!! Welcome to California where everything is higher (except common sense!) LOL! You’re my best promoter, Geri! Love the “dry” camping! I have a zucchini that is just like yours! Amazing how that happens so fast! Hi Sue….gas prices in CA are higher than anywhere else in the country due to environmental taxes other states don’t have. The further you are from a major city, the higher they are. You can find a few stations in our area @ $3.99, but you definitely don’t want to come anywhere near here (N.W. Los Angeles County). It is $3.99 in North Dakota too… the number two oil producing state in the union. And it isn’t the taxes… it is the greedy oil companies that stiff us… because they can. Sue, there’s such a thing as being too honest, lol! Lisa and Trotters, fumbling around, trying to get good at RV living, lol! Don’t worry about getting good at RVing, just RV and that’s good! I was in California last winter and needed a refill on a prescription and when I saw the price I asked “Why so High?” The lady at the counter who knew I had it filled in AZ said “Cause it’s California don’t Ya Know?”. Less than a hundred miles away I could have saved forty dollars! California is messed up and not getting better. To bad nice state otherwise. We keep trying to vote out the people who keep things so sky high in CA but there aren’t enough of us with a head on our shoulders to do it. The people that can, leave. I was lucky to get out when I did. Beautiful scenery but nutsy, crazy, illegal voters are destroying it. Yuck! That zucchini is in the process of morphing through several forms of life. OK Sue, now you’ve done it. I’m sending the zuccini police your way!! On second thought I think I’ll squash the idea. Oh, Jeff . .. . I’m in pain! Oh my gosh….my sister is in possession of an undeclared zucchini!!!! I am still laughing!! I declare, I’ll never go hungry again! The zucchini comment still has me laughing! And the thought of you keeping it until you leave California – that should be memorable. Now you know why I’m leaving the state so fast . . . a zucchini about to explode! Our gas here in western WA is still around $4/gallon. Theykeep saying it’s due to go down. I’m waiting. LOL…………Maybe you should keep the zucchini until you get to the desert and dry it. That way you will never do that again……………Thanks for the happy moments and keep having as much fun as you can!!!!!!!!!!!!!!! If I keep the zucchini that long, it’s liable to take over the wheel. I’ll get in touch, Kathryn. Thanks for letting me know you’re okay. Like you, checkpoints & border crossings make me nervous as well. I’ve never eaten a Canary but always feel like the cat who swallowed one when I’m being asked questions. Dumb old me might have turned around to declare that Zucchini, but luckily I have Kelly to keep me from doing that kind of dumb stuff. I didn’t like the picture of me being scolded by that lady with the clipboard. You are lucky they didn’t search your entire rig. They don’t do it often but they at times they will. You probably didn’t hit the number, lucky you. I was leaving Brookings once and realized I had some oranges and other fruit. Not much but I stopped along side the road before the entry station and ate it. I’d rather do that than have them take and throw it away. One other time I turned around and found a dumpster. So peeled, cut up and put the fruit in a container and tossed the peelings. You won’t take it once it’s peeled and prepared. Alfred Loeb SP that’s generally where I stay when in that area. Lily loves the river and I swimming in it. Their sites also have water along with electric. No sewer though, you have to go to Harris for the dump. I always think the inspectors at the Cali border never have to buy produce…they take it away from tourists. lol. They used to give you the option of pulling over to eat it if you don’t want to give it up to them, don’t know if they still do that. I hate going through check points too, don’t know why cause I am the most honest person ever. lol. One time in Utah we got stopped by fish and game and asked how many fish we caught and to see our fishing license. They came into the motorhome and looked in our fridge to see if we were telling the truth. That’s funny about the toilet paper. Never thought about the dampness doing that. Interesting comment. Yeah, the toilet paper… what a shock to pick up that damp roll in the middle of the night. You absolutely make me laugh! Your ability to write makes the reader…at least Jules and I ..feel like we are right there with you. The checkpoint..aka bug station…opps forgot to warn you. On the highways in California vehicles with trailers must travel lane farthest to the right. If you are on a highway with at least four lanes in one direction…it’s OK to drive with a trailer in the lane immediately to the left of the slow or right-most lane. The clue will be…..you need to be in the same lanes as the big rigs. Watch out for the HOV lanes or diamond painted on the roadway..that is car pool and Spikey and Bridget don’t count as legal passengers. Actually travel trailers can’t be in the car pool lane. Max speed is 55 for trailers. On the toll bridges…the wide lane will be on the right….follow the big rigs. Hope Bridget is doing better. Your comment further illustrates why I left California. I can’t keep up with all the rules and regs. It’s scary. No Bridget/Spike blogs? Did I miss something while at the KS get-together, where we talked about you? Met Reine and couple of other RVSue blog followers. Hope your experience in Calif goes better than mine. The Canine Corner will be active again soon…. temporarily down due to injury. I drove the coast of CA, OR, WA into BC, Canada via highway 101 with my sister a few years ago. We camped at state parks in a tent but ate our meals on the road. It took us two weeks with extended stops in Eugene, OR; La Push, WA, and Vancouver, BC. It was fun and memorable. We learned so much about nature i.e. birds, trees, plants, critters & toured several light houses. We hiked the rain forest in Forks that was absolutely beautiful. I love your blog. Last year younger sister and I took a road trip to Glacier National Park…again we camped and never stepped near a hotel. Sounds like you know how to get a lot out of life, Rita. Glad you enjoy the blog. California is an expensive place to be. Fruit flys and bugs or other sorts can come in on fruits and veggies so thet is the problem. Wow – even if they are in your fridge and you’re gonna eat them soon? This is good to know. Sort of like going through customs, eh? When my family moved to Calif in 1950, they had them then. Think they have been around since the 1930’s at least. I am always entertained and interested when I read your blog. Sorry CA gas is so high. When one posted was warning you about which lanes to be in and that, I thought of another warning you should know about and that is when you pull of the freeway to a city be extremely careful at intersections. If you see beige poles with boxes on top of them They are cameras and are waiting for you to make the slightest mistake so they can take your picture and send you a $500 ticket. I have one on my fridge right now that I am waiting to go fight. I no long go to that particular intersection because I will not get another ticket. If I don’t win fighting it I’ll have to pay out almost $800 between the ticket and traffic school. But have fun in CA, if you can. I really don’t know why anyone would want to visit us right now. Golleee… more rules! I’m sorry you have to deal with that ticket. Good luck! $800 is a lot of money…. What the heck do poor people with a family do? Hi Sue, Just wanted you to know that you have been such an inspiration to me this year as well as I am sure to many others following your travels. So much for me I just purchased a “Scamp” It is a oldie but goodie..Good price pretty good shape. I do not plan to full-time yet but will travel the West coast and western states next year..I am excited and freaked out at moments but I am going to do it!! Thanks for sharing all you do..and most of all with humor, patience and determination..See you on the road I hope..hope to go to AZ this winter for a couple months…Safe Travels! Congratulations on your Scamp, Miriam! I wish you many fun trips with it. I was telling my boss the other day that in California we are so used to these ridiculously high gas prices that the oil companies have us right where they want us. I’ve been paying about 4.19 a gallon for so long that when it goes down to 3.99 (for about ten minutes) it’s like some huge celebration. Now I no longer go anywhere for 2 reasons, no money to spend once I get there, and no money to buy gas to actually GET there. You can check gas prices on gasbuddy.com to see how much gas is in an area and find the cheapest place to buy it. You can even get an App if you have one of those newfangled cell phones….. Hope the vet visit went well. I’ll be checking back to see. I’m usually too frazzled to be looking for the best price or I’m in a place where it’s the only game in town. Oh well, I appreciate the comment. What a great comment, Debra! I’m so pleased my blog helps you hang on until you can be “out there,” too. I’m also happy for your two “babies” that they are still with you. Thanks for writing.